Much shipping is done by actual ships. An individual nation's fleet and the people that crew it are referred to as its merchant navy or merchant marine. Merchant shipping is the lifeblood of the world economy, carrying 90% of international trade with 102,194 commercial ships worldwide. On rivers and canals, barges are often used to carry bulk cargo. Cargo was transported by air in specialized cargo aircraft and in the luggage compartments of passenger aircraft. Air freight is typically the fastest mode for long distance freight transport, but also the most expensive. Intermodal freight transport refers to shipments that involve more than one mode. More specifically it usually refers to the use of intermodal shipping containers that are easily transferred between ship, rail and truck. Free on board (FOB)–the exporter delivers the goods at the specified location (and on board the vessel). Costs paid by the exporter include load, lash, secure and stow the cargo, including securing cargo not to move in the ships hold, protecting the cargo from contact with the double bottom to prevent slipping, and protection against damage from condensation. 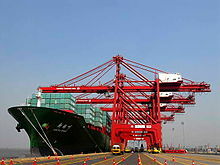 For example, "FOB JNPT" means that the exporter delivers the goods to the Jawahar lal Nehru Port, India, and pays for the cargo to be loaded and secured on the ship. This term also declares that where the responsibility of shipper ends and that of buyer starts. The exporter is bound to deliver the goods at his cost and expense. In this case, the freight and other expenses for outbound traffic are borne by the importer.